The Vertical Farm. by Dickson Despommier. Common Sense when you think about it. I had the great pleasure to meet Dickson Despommier recently at the wonderful PINC conference in Sarasota Florida. I loved his thoughts, ideas and work, inspired by his research on how we, as a growing humanity, with a voracious appetite for food and water, who increasingly live in urban environments feed and sustain ourselves. His message is a powerful one. A compelling story of hope and optimism, forward thinking, but, flavoured with, Houston we have a problem and we have no option but to fundamentally change how we farm and feed ourselves. 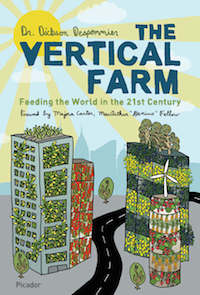 His most recent book, The Vertical Farm – is a combination of scientific research and common sense, directed towards helping us craft a new way of thinking about food production and consumption. Good for people and planet. This is how Dickson sees our future panning out. By the year 2050, nearly 80% of the earth’s population will reside in urban centers. Applying the most conservative estimates to current demographic trends, the human population will increase by about 3 billion people during the interim. An estimated 109 hectares of new land (about 20% more land than is represented by the country of Brazil) will be needed to grow enough food to feed them, if traditional farming practices continue as they are practiced today. At present, throughout the world, over 80% of the land that is suitable for raising crops is in use (sources: FAO and NASA). Historically, some 15% of that has been laid waste by poor management practices. What can be done to avoid this impending disaster? Here is Dickson, a charming man as well as a very clever one, telling his story about the Vertical Farm.